One CAT for all your projects! If you are among those who have already transitioned to memoQ software for professional translators, you will be glad to know that you can use it with all our projects! If, on the other hand, you are not yet familiar with its versatility and efficiency, we believe that you will appreciate its features as well as our decision not to create the umpteenth software for professional translators: these kind of solutions are usually too slow, full of unresolved bugs, have no assistance or follow market logics that we have never loved even as translators. it allows to multiply the volume and the quality of the daily production. However, the main reason why we chose memoQ is its interoperability: memoQ allows to manage files and packages from other translation software, like SDL Trados, SDL Trados Studio, Transit, Wordfast, Word, etc. In this way, freelance translators are able to focus on just one CAT (Computer Aided Translation) tool and they save time and money that otherwise should have invested in the upgrade of licenses or in the use of new software. Moreover, we believe that if a professional translator uses just one CAT tool, (s)he becomes more and more expert and will also increase the speed, the production and therefore the earnings! The Foreign Friend organizes periodically training courses in many cities, in order to teach how to use this software for professional translators and some of its advanced features: if you want to take part in the next course, contact one of our PMs or send us an email. 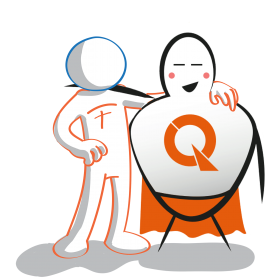 And remember that Kilgray grants a 45 day free trial period for memoQ during which their technical support is at your disposal. Moreover, all our vendors are entitled to a 30% discount on the “Translator Pro” license (which includes one year of support and updates).